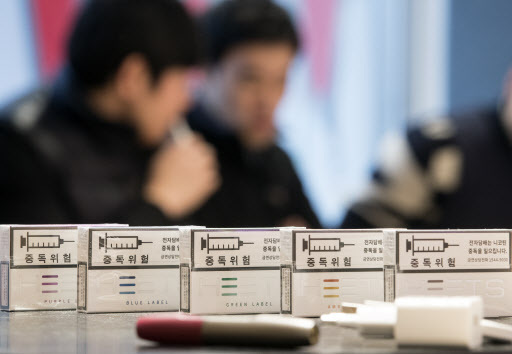 South Korea's tobacco imports rose to the highest level in 15 years this year, led by the popularity of heat-not-burn electronic cigarettes, government data showed Saturday. South Korea imported $199.96 million worth of cigarettes in the first 11 months of this year, marking a 61 percent spike from $124.1 million in the entire year of 2016, the data from the Korea Customs Service showed. The 11-month tally already marked the highest annual total since 2002, the KCS said, noting the total for the entire year was well expected to surpass $200 million. By country, cigarette imports from Indonesia took the largest share with $45.9 million worth of products shipped here in the cited period, followed by the Philippines with $36.06 million, the office said. Italy took the third place as HEETS, a tobacco refill for an electronic tobacco heating device called iQOS, made a splash in the domestic market since its launch in June. Imports of the smokeless cigarettes for iQOS totaled $30.62 million over the period, raising the overall tobacco imports this year. E-cigarettes accounted for about 3 percent of the nation's total tobacco market in the third quarter of this year, with vaping products rapidly catching up, according to industry data.